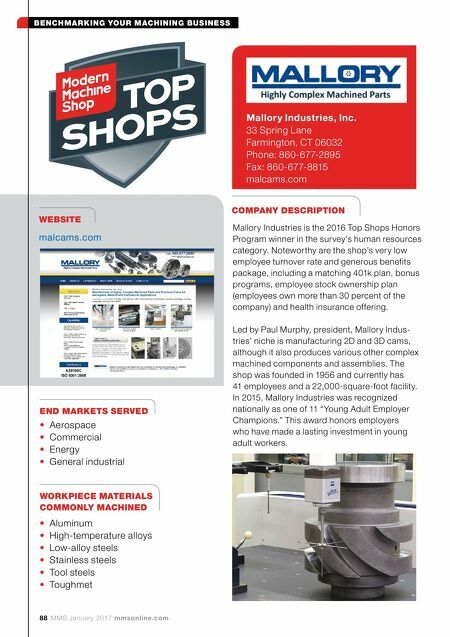 88 MMS January 2017 mmsonline.com BENCHMARKING YOUR MACHINING BUSINESS END MARKETS SERVED WEBSITE malcams.com COMPANY DESCRIPTION WORKPIECE MATERIALS COMMONLY MACHINED Mallory Industries, Inc. 33 Spring Lane Farmington, CT 06032 Phone: 860-677-2895 Fax: 860-677-8815 malcams.com • Aerospace • Commercial • Energy • General industrial • Aluminum • High-temperature alloys • Low-alloy steels • Stainless steels • Tool steels • Toughmet Mallory Industries is the 2016 Top Shops Honors Program winner in the survey's human resources category. Noteworthy are the shop's very low employee turnover rate and generous benefits package, including a matching 401k plan, bonus programs, employee stock ownership plan (employees own more than 30 percent of the company) and health insurance offering. Led by Paul Murphy, president, Mallory Indus- tries' niche is manufacturing 2D and 3D cams, although it also produces various other complex machined components and assemblies. 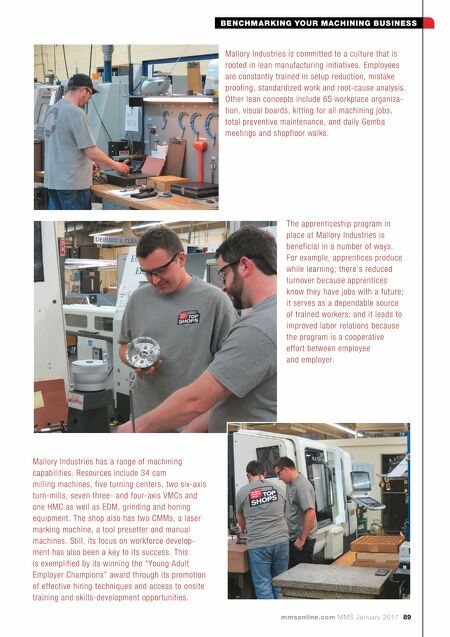 The shop was founded in 1956 and currently has 41 employees and a 22,000-square-foot facility. In 2015, Mallory Industries was recognized nationally as one of 11 "Young Adult Employer Champions." This award honors employers who have made a lasting investment in young adult workers.